Over the past two years, more clients are incorporating reclaimed elements in constructing and decorating their homes. Wood, bricks, stone, tile and glass—to name a few—are being used in new and innovative ways, adding instant character to new homes. Here are some ways we have incorporated reclaimed elements into our projects. Take a look, and see how you might want to incorporate the three Rs into your new space. Reclaimed Wood—is perhaps the most versatile material we have incorporated into our projects. The options are almost endless, but here are applications we see regularly: flooring, exposed beams, wall application, cabinetry, shelving, dining tables, stools, shelving. In one interesting project, we incorporated chestnut timber—reclaimed from a turn of the century tobacco mill—to create exposed trusses in a magnificent great room (chestnut trees can no longer be harvested). Reclaimed white oak planks have become a stunning wood floor in another home. 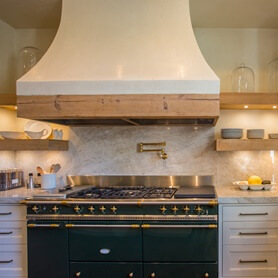 We have also used reclaimed beams to serve as open shelving in a stunning kitchen. Using reclaimed planks, we have made a lengthy hallway (as risk of being boring) full of character. Stone & Brick—have also been in high demand. We have used reclaimed brick from an abandoned factory for the exterior of a home. Fortunately there was enough brick remaining to incorporate it into the wine cellar. On another occasion, our clients travelled to France to obtain one-of a-kind pieces. They found two antique limestone mantles and shipped them back to Houston in a container. Tile—also offers many versatile applications. From fireplace surrounds, kitchen backsplashes to bathrooms, reclaimed tile can really set the tone for a room, and there are many different styles available. In one of my favorite uses of reclaimed material, a powder room floor was clad in 19th century colored cement tile from Chateau Domingue.